Nanohybrid and Nanoporous Materials for Aqueous Environmental Pollution Control gives a comprehensive treatment of fabrication methods and their application in environmental remediation, including adsorption, catalysis and signal transfer in pollutant detection. The design, fabrication and application of nanohybrid and nanoporous materials for environmental pollution control are described in detail, along with discussions on their synthesis, characterization, and applications in different aspects of pollutant treatment. 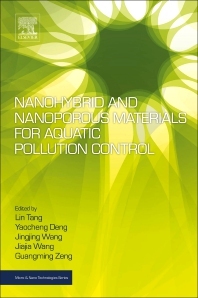 Chapters introduce the design and synthesis of magnetic nanohybrid materials, advanced oxide process-photocatalytic degradation of environmental pollutants based on nanomaterials, and nanohybrids of iron based materials for reduction and oxidation of aqueous recalcitrant pollutant. Finally, challenges and suggestions in the application of nanomaterials for environmental pollution control are discussed, as is an analysis of the future perspective of nanomaterials for environmental application. Lin Tang received her Ph.D. in 2009 from Hunan University, China, and then worked as a visiting scientist in Columbia University, USA for a year. She has been a professor in College of Environmental Science and Engineering, Hunan University since 2012. Her research interests include removal of heavy metals and refractory organics from aqueous environment using functional carbon/iron based nanohybrid or nanoporous materials, wetland remediation, as well as nanosensors for pollutant detection. She has published more than 140 scientific publications in international journals and is a named inventor of 45 issued China patents. Yaocheng Deng received his B.S. from Hunan University of Science and Technology in 2013. He is now a Ph.D. candidate under the supervision of Prof. Lin Tang at the College of Environmental Science and Engineering, Hunan University. His current research includes photocatalytic and photoelectrochemical removal of environmental pollutants. Jingjing Wang received her B.Eng. in environmental engineering from Lanzhou Jiaotong University in 2013, and her M.Eng. in environmental science and engineering from Hunan University in 2016. She is now a Ph.D. candidate under the supervision of Prof. Lin Tang in College of Environmental Science and Engineering, Hunan University. Currently, her research interests mainly focus on the removal of recalcitrant organic pollutants in water and sediment using functional nanohybrid and nanoporous materials. Jiajia Wang received his B.Eng. in environmental engineering from Anhui Polytechnic University. He is now studying for a PhD degree at Hunan University under the guidance of Prof. Lin Tang. His research interests are in remediation of water environments and also in water pollution control techniques, especially the photocatalysts used for organic pollutant decomposition in contaminated water.